More and more of the MTA's budget, which is growing overall, is going to paying for its debt service every year. Image: RPA/ESTA. 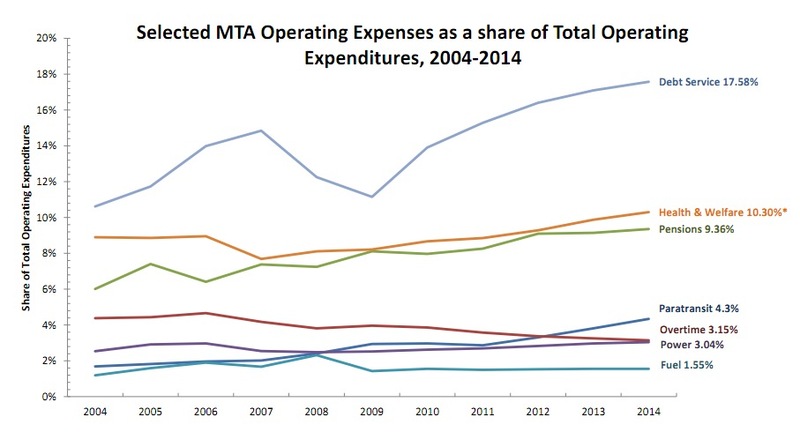 In 2003, labor costs dominated the MTA’s budget sheets. Just under 73 percent of the transit agency’s operating budget, which pays for day-to-day spending but not system expansions or major repairs, went to workers, according to a new analysis by the Regional Plan Association and the Empire State Transportation Alliance. 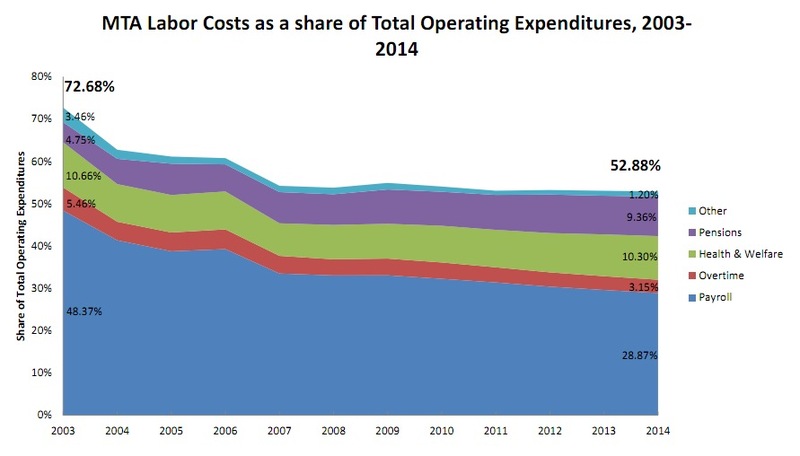 By 2014, however, labor’s share of operating expenses will have fallen to only 53 percent. That won’t be because total compensation, including rapidly rising health care and pension costs, has shrunk — it hasn’t — but because the MTA is swimming in debt. Every year, more and more money that might go toward paying bus drivers, buying fuel, cleaning stations or keeping fares affordable is instead spent on debt service. Even over a period when pension costs will have risen by a billion dollars per year, it’s debt that is chewing up the MTA’s budget. Even though labor costs have been rising, particularly pension and health care costs, their share of the budget has fallen, because debt payments are rising that much faster. Image: RPA/ESTA. That debt is the outcome of decades of diminishing state support for public transit. After a major infusion of capital under the Hugh Carey administration, Governor Mario Cuomo cut all direct support for the MTA capital program. Though Cuomo found other revenues for the capital plan, notably by repurposing Westway dollars for transit, George Pataki just let those zeroes stand and put the cost of the capital plan on the MTA’s credit card, starting the debt build-up in earnest. Pataki also started using dedicated transit funds to pay the state’s commitments to the MTA, essentially double-dipping on those funds and costing transit almost $200 million a year. The 2009 passage of the payroll tax helped the MTA’s budgets significantly — it is now the agency’s largest dedicated revenue source — but Albany’s decisions to kill congestion pricing and bridge tolls meant that the MTA still had to borrow heavily to pay for repairs and mega-projects like the Second Avenue Subway. The result is a massive run-up in debt. Though the MTA spent only $848 million on debt service in 2004, according to RPA, it is projected to spend more than three times as much, $2.67 billion, in 2014. Debt alone will eat up 17.6 percent of the MTA’s operating budget by 2014; worse, RPA says that an alternative calculation shows the 2014 debt load at 23.1 percent of the operating budget. When paired with the precipitous loss of revenues caused by the recession, it’s no wonder that the agency was forced to implement historic service cuts and fare hikes last year. Nor does it help that the state and city’s direct contributions to the operating budget aren’t indexed to inflation; their real values decline every single year (of course, because of Pataki’s double-counting, the state’s operating assistance has essentially been flat at an effective zero). 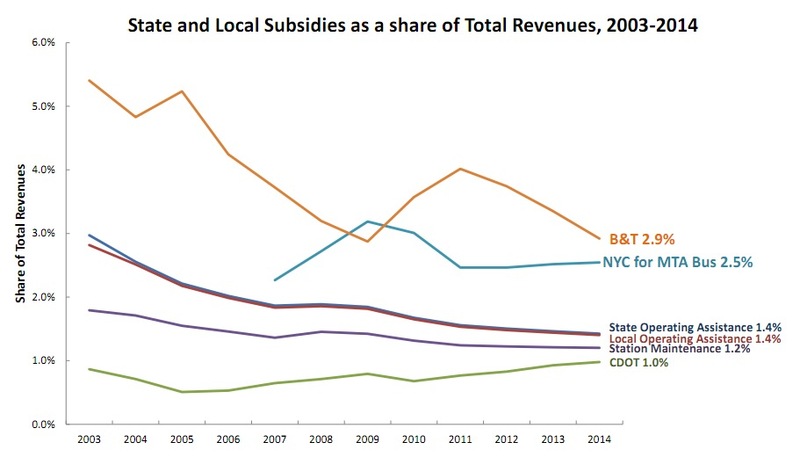 Though the state has created new dedicated revenue sources for the MTA, especially the payroll mobility tax, which is larger than any other dedicated transit tax, but direct operating subsidies from the city and state have fallen. Image: RPA/ESTA. This isn’t to say that the right debt load is zero. That debt comes from paying for the MTA’s capital program, which keeps the transit system in good condition and allows for expansion. It’s not unreasonable to shift some of the cost of debt service onto the operating budget, which is funded by fares, those ever-dwindling state and local subsidies, and by dedicated taxes, especially the new payroll mobility tax. But the state government has left the last three years of the current capital plan almost entirely unfunded, boosting the debt load significantly. And no one knows how, or if, the next capital plan will be paid for. The fuse on the debt bomb is getting shorter all the time. In fact, it’s already starting to go off. Is there really 6% emergency coverage stuff going on? Or is this just a symptom of bad management?! Six percent seems like a lot of “flex” in a big system like this. I guess we should be happy it’s come down from 7.5% in 2003. Uggh. @0cb5a5d1acdc536518491db8f69af89e:disqus : I recall that there are certain bus and subway runs that come with “built-in” overtime. For example, if a subway run, including lost time at both ends, takes 2 hours, then in a 7 hour working day, a driver can do that run 3.5 times. Since half a run isn’t really useful, the MTA might schedule an hour of overtime to cover the remainder. Since there’s a significant fixed cost overhead to hiring a new union employee (healthcare, retirement, etc. ), a little bit of overtime, though expensive, can save money compared to hiring another person. The problem is that much of that debt was for ongoing normal replacement, which is really mere maintenance for a mature system. That is an ongoing expense that should have been funded by ongoing revenues. Now not only is the money not going for TA workers, it isn’t going for construction workers either, and system deterioration and collapse is on the table. And among both TA workers and construction workers, more and more of the money that is going to “workers” is in fact going to ex-workers in retirement, not people actually doing work. If there was generational equity, of course, those retirement benefits would have been fully pre-funded in the past, when those ex-workers were working, and would not have been retroactively enhanced without any funding at all. That’s the MTA. But big picture, you can make the same points about…the United States. Just as a follow up, look at this chart and think about what it means. We aren’t in a recession. We are in a slow motion collapse as a result of the unraveling of a 30 year economic era. After being stable as a share of GDP for 30 years, total U.S. (public, business, consumer, financial) debts soared from 160 percent of GDP in 1980 to 220 percent of GDP in 1987. After a brief period of stability (and economic stagnation), it soared from there to 380 percent of GDP in early 2009, when President Obama took office. I read today that even those approaching retirement are deep in debt. Whatever happened to the mortgage burning party? Total U.S. debt has since backtracked, mostly due to defaults, to about 354 percent of GDP. Only massive federal deficits have kept the debt-driven, consumer-based U.S. economy, in which most workers are paid less and yet are expected to spend more, from a 1930s-style collapse — with federal debt soaring to make up to the fact that American consumers can’t borrow anymore. And all that increase in federal debt has accomplished is to call the federal retirement benefits that are all younger generations will get into question — but only for those under 55 with no restraints on debt-funded increases for those older according to Republican proposals. The federal government is borrowing 40 cents for every dollar it spends, and we’re still at 9 percent unemployment with downward pressure on wages. And if it stops going into debt to keep people spending, the collapse that was halted in 2008 might occur. How painful has the limited amount of deleveraging thus far been, and how unpopular has President Obama been because of its economic effects? What will it be like to get back to 160 or even 220 percent of GDP, and how long will it take — given that the lower incomes of younger generations and the ongoing retirement of richer older ones will be a drag on the economy? Japan? Argentina? Weinmar Germany? Looks like Japan is the BEST option. But regardless of what happens, I can get around by bike, at least for 20 years until I hit age 70. – 6% overtime isn’t a big deal. And MTA compensation per employee is the same as at Toei and not much higher than at JR East’s transportation business, both in areas with lower average incomes than New York. – An increase in debt service from 10 to 18% of the budget isn’t enough to explain a decline in labor costs from 73% to 53%. What’s the rest? Unfortunately, we aren’t Argentina in 2000, following 50 years of economic stagnation, repeated defaults, and falling living standards. We are Argentina in 1950. With creeking old equipment, however, the Buenos Aires subway continued to run through it all. So there is hope. That’s actually a country I’d like to visit someday, to see what it’s like to follow a few generations of something for nothing leadership, and perhaps feel better about it. MichaelK — That makes sense… still seems like a bit much, but you describe a potential “mitigating factor” that puts me a but more at ease. Debt service is rising high again…. Interesting topic. I wish I could understand what you were saying about Pataki’s double-dipping. A short explanation would work wonders.